You publish a Trumba® calendar to the Web when you want to make it available to the public. You then embed the published calendar spuds into your own website, giving site visitors all the benefits of your active Trumba calendar right on your site. Tell me more about these calendar spuds. Visitors to your calendar can subscribe to it or take other actions on events. After you publish the calendar, the spud code is also served up on a rendered calendar that is hosted on a Trumba server and given a unique Web address (URL). While this URL is available to anyone who has access to the Web, it appears under the Trumba.com domain, such as in the following example, so is primarily a preview and test tool for internal use only:"http://www.trumba.com/calendars/"
Note If you've already worked with your Trumba Sales representative to get an event submission form, you may also be able to use it with your hosted calendar. For more information, go to Get an event submission form. To publish your calendar and put it into your website, you complete two separate steps. 1 When you're done entering events, go to the calendar you want to publish, click Publish, select a default view, select the calendars you want to mix in, and specify other publishing settings. Each publishing setting has a description of what it's for, along with additional help and tips that you can open by clicking the green Help buttons ( ). 2 Paste code that Trumba Connect generates for calendar spuds into your own web pages. Visitors get the benefits of a Trumba Connect active calendar without leaving your site. Views and spuds are terms you'll see referred to a lot in the context of publishing Trumba calendars. When you publish your calendar, you select a default view. The view sets the calendar layout and other attributes that determine how events are presented on the main calendar. For example, for some views, you can change the number of events that appear on a page and how they're grouped within that page. You can also allow visitors to select multiple events to take action on, or disable update markers that appear when you make changes to your events. Each view has its own customization settings. Examples of views: Classic Month and Classic Table views. After you publish your calendar, Trumba Connect makes your calendar available in a few standard views in addition to your default view. You can add, remove, and customize views in the Publishing Control Panel. For every calendar you publish, Trumba Connect creates calendar spuds, each of which presents your calendar data in a different way. Spuds behave like portals on your web pages, which draw calendar information directly from the Trumba server on which your calendar is hosted. Because they draw information from Trumba Connect, spuds on your site immediately show updates you make to your calendar in Trumba Connect. Your calendar itself (main calendar spud), where people go to find details about and take actions on your events. A list of your next several events, which serves to direct people to your main calendar. A list of available views of your main calendar, from which visitors can pick the one they want. A tool to search for events that contain specified keywords or to filter events through event fields. In the Publishing Control Panel that appears after you publish your calendar, you can see the spuds that are available in each spud category on the various tabs. Tell me more about the spud categories. The hosted view is a view of your published calendar that is hosted on the Trumba servers. Each hosted view has its own unique URL. If you're not ready to embed your spuds and you want to preview and test your published calendar, you can take advantage of the hosted view. For example, you can test event and calendar actions by setting reminders, adding events to your personal calendars, subscribing to the calendar, and more. 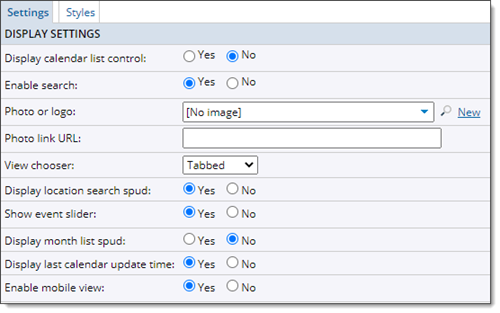 You can test control spuds you have implemented by searching for events, switching between views, hiding and displaying mixed-in calendars, and more. If you enable mobile view, you can narrow your browser window or use a mobile device to test how your calendar will look on smaller screens. You have the option of customizing the hosted view settings (for example, which control spuds to display, whether or not to add a logo or enable mobile view) and styles (for example, page and sidebar background colors, text colors and sizes, and more). Keep in mind that while an Internet search might send an occasional visitor to the hosted view, the view is primarily a preview and test tool for your internal use. Can I make the hosted view unsearchable? The hosted view displays a selection of control spuds to the left of the calendar. Hosted view with spuds to the left of the calendar. By default, in narrow browser windows (less than 735 pixels wide) and on mobile devices, the hosted view is set to automatically hide the control spuds. To display the spuds in narrower environments, you can click Show Controls above the calendar. Hosted view with spuds hidden. Tip If you set your calendar to automatically detect mobile, when you preview the hosted view on a mobile device, you see a mobile table view specifically configured for the narrower mobile environment. Learn more. In the editing environment, make active the published calendar you want to preview. Click Publish. In the Publishing Control Panel, click the Hosted View tab. To preview the hosted view, click Preview. If you want to provide a link to the hosted page, copy and paste the URL. Replace View My Calendar with whatever text you prefer. Replace webname with the web name of your calendar. To customize the hosted view, click Edit Settings & Styles. On the Edit Settings for Hosted View page, on the Settings tab, select the spuds you want to display and the features you want to enable. If you want to brand the hosted page with a photo or logo, add the image. Provide a URL to link the image to a webpage. Hosted view customization settings, Settings tab. On the Styles tab, set the colors and font sizes you prefer. At the bottom of the form, click Preview to preview your customization choices. When you're satisfied with , click OK.
After you place calendar spuds into your site using the default settings, you might see that the design of the calendar doesn't exactly match the design of your site. In that case, you can take advantage of the flexibility Trumba Connect provides in customizing the views you provide of your main calendar, as well as styles and other settings for any of the spuds you want to use. In the Edit Publish Settings page, you select a default calendar view, the calendar name, mix-ins, and other settings that apply to the main calendar behavior. You can change these settings any time. In your Trumba account, display the calendar and click the Publish button that appears above it. If the Publishing Control Panel page appears, on the Publish Settings tab, click Edit Publish Settings. In the Edit Publish Settings page, select the new settings you want. Use the list of help topics below if you want more information about a particular setting. The topics listed here provide more information for selecing settings on the Edit Publish Settings page. If your published calendar is no longer relevant, or you change your mind about making it available on the Web, you can unpublish it to remove it from the Web and remove it from your website. Open your web pages that contain the Trumba spud code so that you can edit them, remove the spud code from the pages, and then save and close the files. In the Trumba editing environment, display the calendar you published and click Publish. 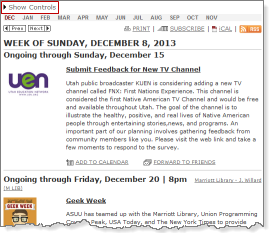 Toward the bottom of the Publishing Control Panel, click Unpublish. Note If you unpublish a calendar but do not remove spud code from your own web pages, the spud code will display a Calendar not available error message on your pages. If your calendar was indexed by a search engine while it was published, even though the calendar no longer exists on the Web, its name, description, URL, and other searchable event information may still be listed in relevant search results until the search engine re-indexes the Trumba Connect public calendar site.